Hand'Solo Records » Blog Archive » Final $5 Rap Show of 2018 a big blowout!! Home Bass > Final $5 Rap Show of 2018 a big blowout!! The 5DRS has had an amazing year of shows featuring diverse styles and performances by rappers, DJs, producers and dancers from across Canada and the USA! You helped us make our 8th year our best yet – so let’s close out 2018 with the crew and fam that made it all possible, including you and yours! 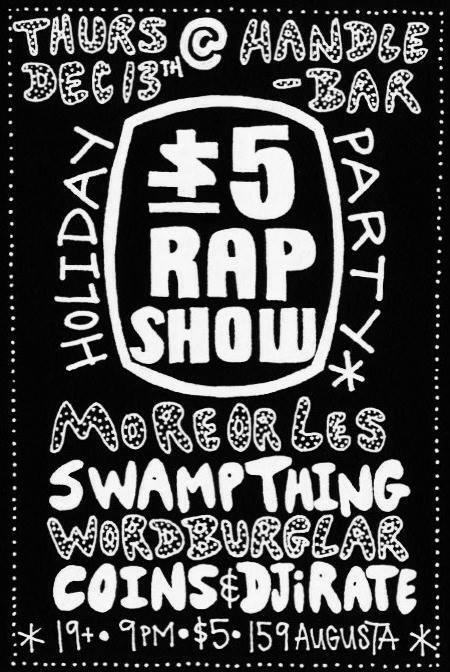 More Or Les, Swamp Thing & Wordburglar have all released monumental rap records this year so it’s only fitting they close out the 2018 season with feature performances! Starting sharply at 10:30 PM. Come for the live performances followed by a live DJ set, drinks and all the good times you’ve come to expect at The $5 Rap Show. PLUS Peter Project aka COINS will be rocking the bells on the 1s and 2s with one of his patented DJ party sets keeping things moving all night! More rap than you pay for.